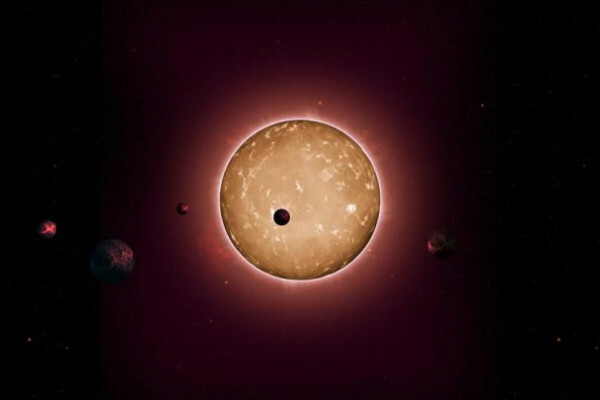 Tiago - In this paper, we announce the discovery of a fascinating planetary system with 5 Earth-sized planets that dates back to the dawn of the galaxy. The innermost planet has a size similar to that of Mercury and its size has been measured with the precision of only a few tens of miles. That's an impressive technological achievement. The 3 intermediate planets are the size of Mars and the outermost planet is slightly smaller than Venus. Chris - When you say "the dawn of the galaxy", how old is that and which galaxy are we talking about here? Tiago - We're talking about our own galaxy, the Milky Way and the age of the system has been estimated at an impressive 11 billion years. The universe itself has an estimated age of 13.8 billion years, so these planets existed when the universe was less than 20% of its current age. Chris - Had we previously not believed that small rocky planets like the Earth would come along quite so quickly in the universe's evolution? Is that why this is a game changer, what you found? Tiago - Absolutely. Only a few years ago, we thought that formation of planets around old stars was unlikely to happen. That's because old stars miss or are less abundant or their environments are less abundant in heavy metals, think of iron for example, and those heavy metals are the building blocks to planetary formation. So, it would be expected that the formation of a planetary system around such an old star would be a rare event. Chris - Why are those very early stars and therefore, the planets that might or might not form around them devoid or lacking in these metals? Tiago - Very good question. So, the primordial universe was composed of hydrogen and helium. It was only in the interior of first generations of stars that heavy elements were formed. When these stars died and exploded as supernovae, they released these first synthesised heavy elements into the interstellar space and then the following generations of stars and planets could already use those. Chris - Because I suppose this suggests that planets of the sort of size, scale and possibly the environment of the Earth could've existed for a lot longer then than we had previously anticipated. Tiago - Yes. Never before had planets this small been found around a star this old. Chris - How did you find them? Tiago - To find these planets, we needed to monitor this particular star with the Kepler satellite. The Kepler satellite collected 4 years of photometry, basically measuring the changes in brightness of stars. When planets cross in front of the apparent disc of their stars, there is a slight dimming of their brightness, and that's how we detected these planets. Is the Universe infinitely big? Is the universe expanding evenly in all directions? Climate Change: Real Warmth or Cold Memories?